California's last nuclear power plant is scheduled to close. 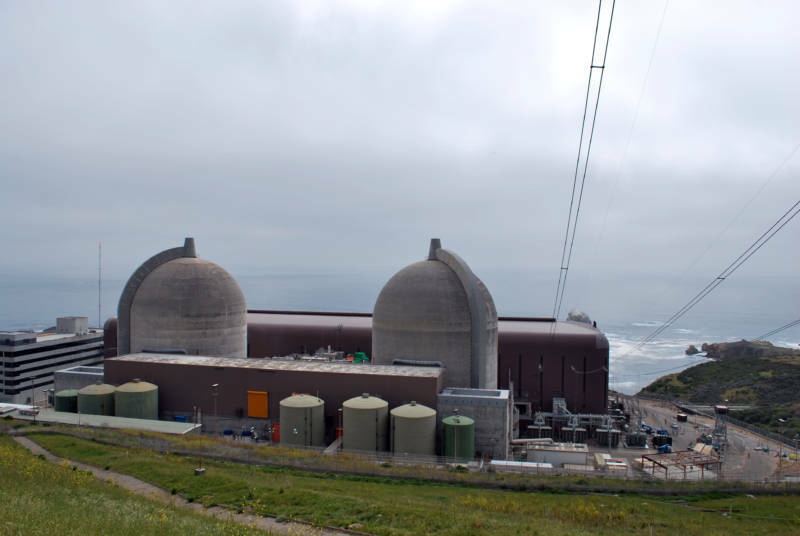 Pacific Gas and Electric announced Tuesday that Diablo Canyon will shut down before the end of its useful life. It's a big win for some environmentalists. But others say the utility is giving up on a clean energy source. For Linda Seeley, the end of nuclear power in California is something she's been championing for 40 years. "Right out there we've got tons of highly radioactive waste, sitting," says Seeley. Seeley and I are at the front gate of the Diablo Canyon power plant. It’s right on the coast in Central California. Seeley is with a group called Mothers for Peace and she was one of thousands of protestors here in the early 1980s trying to stop the nuclear plant from opening. Right now, she’s inching her foot across a blue line on the pavement that says no trespassing. "When you wanted to commit civil disobedience you would intentionally walk across the blue line," says Seeley. Which Seeley did and was arrested twice (even Governor Jerry Brown showed up to support the protesters). She’s been fighting nuclear ever since, because she sees safety risks, like the ones at the Fukushima Daiichi plant that melted down in Japan five years ago. It confirmed her worst fears about nuclear safety. Diablo Canyon is sitting next to earthquake faults and the nuclear waste is stored on site. "It’s the ultimate act of hubris to create some kind of waste that you don’t know what to do with, that is toxic," says Seeley. But some other environmentalists, like Michael Shellenberger, have changed their mind. "Nuclear is just a huge part of moving towards a cleaner electrical system," says Shellenberger. Shellenberger is a long-time environmental activist who started his own organization because he thinks nuclear power can be one solution to climate change. Nuclear doesn’t put out carbon dioxide, like burning coal and natural gas do. "You start to have these questions about who you are. I’m feeling really attracted to nuclear power now and I’m feeling a little shame about it," says Shellenberger. He tried to save Diablo Canyon, but Pacific Gas and Electric plans to shut it down in nine years. The utility is switching to renewable energy, like solar and wind, at other sites around California – as state policy requires. "You cannot power the world on wind and solar," says Shellenberger. Wind and solar only work when the sun is shining and the wind is blowing, so California fills in the gaps with power from fossil fuels, like natural gas. Another environmentalist — Ralph Cavanagh with the Natural Resources Defense Council — who was involved with the PG&E negotiations said turning to dirtier fuels is not the goal. "We’re determined to avoid that," says Cavanagh. "We’re all going to work together to ensure that the fears of our adversaries are not realized — that anytime you lose a nuclear plant you automatically get an uptick in fossil fuels and pollution." Cavanagh says there’s still more to be done — like adding more energy storage to the grid, like big batteries. They would make up for the ups and downs of solar energy, instead of using natural gas power plants. But supporters of Diablo Canyon say their fight is far from over. The plan to close the nuclear plant and install more renewables still has to be approved by state regulators.